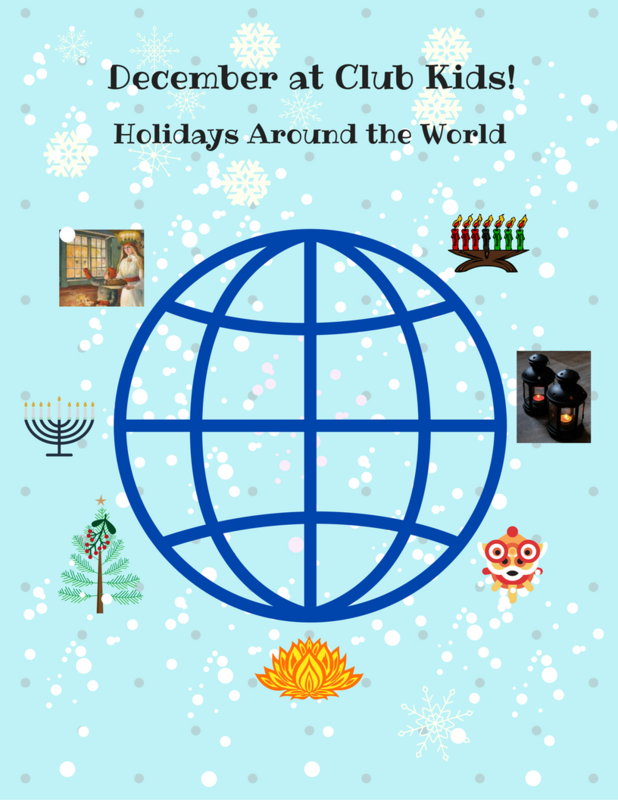 Join us at Club Kids this month for a celebration of 'Holidays Around the World!' We'll have a craft for each holiday and learn about each one! We'll have many books to read that will teach us about different holidays and celebrations. During the first week of Nov 28 - Dec 3, we'll learn about Ramadan, Diwali, Kwanzaa & Hanukkah. Come back the week of Dec 5 - 10 to explore St. Nicholas Day, Christmas & the Chinese New Year. On Dec 13 & 14 we will be making gingerbread men and candle wreaths for St. Lucia Day. The week of Dec 19, join in on lots of Christmas fun as well as the Winter Solstice on Dec 21, the first day of winter. And we will wrap up this month of celebrations with more Kwanzaa & Hanukkah activities as well as celebrating the New Year. It’s sure to be a jam-packed, fun-filled month of celebrations and we hope to see each of you!